The Best Engineered Mouth Guard for Teeth Grinding and Clenching. Made for Teeth Grinders by Teeth Grinders. The BRUX NIGHT GUARD can be worn on the TOP or BOTTOM teeth and is re-moldable at any time. It's made with two different materials offering maximum comfort and durability - it's not too hard on the outside and not too soft on the inside. Why Choose the Brux Night Guard? Bruxism is the medical term for clenching or grinding teeth. While teeth clenching and grinding is usually done at night when you sleep, it can also happen during the day. Nighttime teeth grinding causes excessively worn or chipped teeth, jaw pain, headaches, and a number of other painful symptoms. The remedy is often a dental night guard. A night guard fitted by a dentist will be custom-fitted to your teeth, but they are usually full-size guards that are very expensive and can't be remolded to adjust the fit. Once it’s made, you have to live with it or not use it at all. Boil and Bite mouth guards purchased online or from retail stores can be molded at home and protect against chipped or broken teeth at a fraction of the cost from a dentist. Unfortunately, most of them are full-size guards, and can't be remolded if necessary. Even worse, the materials are usually too hard or too soft. For teeth grinders and clenchers, the hardness of the material used in the night guard is extremely important. Guards made with materials that are too hard can be uncomfortable, while those that are too soft actually promote grinding and may cause jaw pain. Brux Night Guard is the teeth grinding and clenching mouth guard your dentist doesn't want you to know about. What makes this night guard better than what you get from a dentist or at other places? What makes Brux Night Guard better? Brux is smaller than most dental guards making it more comfortable and easier to sleep with it in the mouth than traditional night guards. Brux is moldable by you, in your own home using our boil and bite design. It can also be re-molded for a better fit, if necessary. No more trips to the dentist or waiting for the mouth guard to be delivered. Brux is made with two different materials that are softer than hard guards used by dentists. The softer material is easier on the teeth and doesn’t irritate the teeth and gums. Brux is only $60 - a fraction of the cost charged by dentists, which is approximately $600. That $600 price at the dentist is out-of-pocket and NOT covered by insurance. 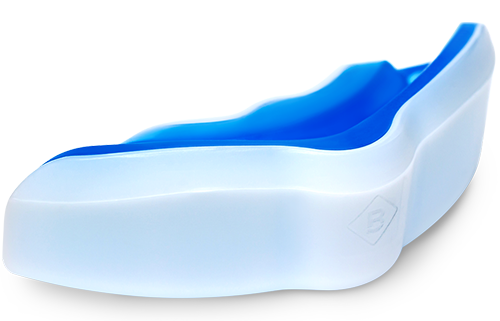 Brux Night Guard was developed by teeth grinders with all the features we wanted in our own custom-designed night guard. We wanted something small and comfortable to wear day or night, which we could mold at home as often as necessary. 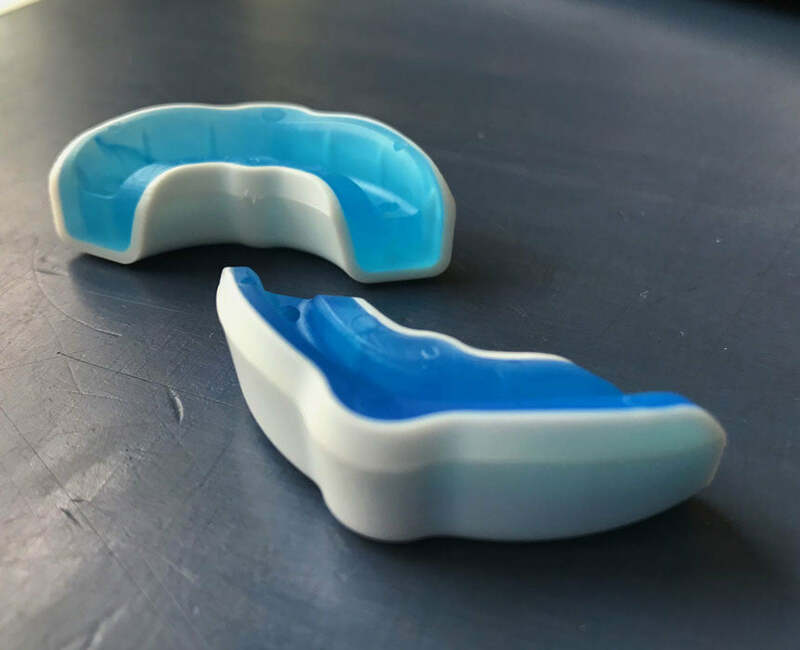 After a year of research and development, we accomplished our goals - a high-quality mouth guard, that is convenient to mold, at a great price. Brux Night Guard is smaller than almost all night guards on the market, making it more comfortable to wear, easier to breathe while sleeping, and no need to worry about an uncomfortable gag reflex. The low profile fit covers only the front teeth and transfers the bite force away from the molars to decrease tension on the jaw. This eases the pain and symptoms of TMJ and headaches while protecting all teeth from clenching and grinding. The unique design also protects against underbite and overbite. At $60, it is much cheaper than the average price of $600 for night guards fitted at the dentist. Because it is moldable at home, there is no need to visit the dentist for a fitting, or revisit the dentist to pick up the finished product. It can be worn on the top or bottom teeth and is re-moldable at any time, saving another trip to the dentist for refitting. Two different materials offer maximum comfort and durability - it's not too hard on the outside and not too soft on the inside. All orders include one Brux Night Guard, a vented storage case, and instructions for molding and daily cleaning. We're proud to say that the Brux Night Guard is made in the USA so you can be sure it is safe for use as an oral appliance. The Brux Night Guard will provide years of teeth grinding and clenching protection. Just don't let your dog get a hold of it. Brux Night Guard was engineered with a low profile design and fit as an alternative to full-size mouth guards on the market. What Else Can Be Done for Teeth Grinding? It’s important that people who clench and grind their teeth save their teeth by wearing a grind guard. This will protect against chipped or broken teeth and might even minimize the symptoms of grinding and clenching. It’s also important to understand that other factors can promote bruxism, such as stress, anxiety, snoring, and certain neurological disorders. Bruxism is considered a sleep disorder because many people grind or clench at night while they sleep. Because of this, it’s important to relax before bedtime to help relieve some of the factors that inhibit a good night’s sleep. Daily exercise, meditation, or a relaxing bath before bed all help to reduce bruxism at night during sleep. "I tried a full size mouth guard and it made me gag. With Brux I had no problem and I could actually breathe with it in. Great job!" "Not only did I stop grinding but my jaw wasn't hurting in the morning either. Thanks Brux!" "Quality product, ordering, shipping, package...everything unheard of today...so impressed!" "I wish I knew about Brux a year ago. Would have saved me a lot of money."